What we want to understand is the correct interpretation of radioactivity measurements, and then how to judge the potential for harm in our bodies. We should also consider the potential for harm in other animals and the plants, because we humans aren't the only important creatures on this planet. Radiation occurs when either energetic particles or energetic waves travel from one place to another. For example, a the heat from a "radiator" is energetic waves radiating through the air which we experience as the spreading of heat. Of course what we're actually interested in here is radiation from nuclear sources, and those effects. This is what they call "ionizing radiation". Ionizing Radiation (not Absorbed Radiation) is "radiation" consisting of particles with enough energy to liberate electrons from an atom or molecule. That is, radiation that causes materials to ionize. Ionizing radiation includes both subatomic particles of matter moving at relativistic speeds and electromagnetic waves on the short wavelength end of the electromagnetic spectrum, which act like energetic particles. Common particles include alpha particles, beta particles, neutrons, and various other particles such as mesons that constitute cosmic rays. In other words, ionizing radiation causes changes in molecules and atoms. Absorbed radiation is what it sort of sounds like - the measure of ionizing radiation absorbed something, and is measured as Joules per Kilogram. Alpha (α) radiation consists of a fast moving helium-4 (4He) nucleus and is stopped by a sheet of paper. 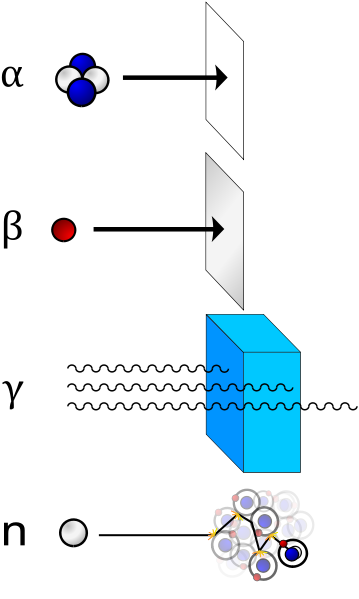 Beta (β) radiation, consisting of electrons, is halted by an aluminium plate. Gamma (γ) radiation, consisting of energetic photons, is eventually absorbed as it penetrates a dense material. Neutron (n) radiation consists of free neutrons that are blocked using light elements, like hydrogen, which slow and/or capture them. Not shown: galactic cosmic rays that consist of energetic charged nuclei like protons, helium nuclei, and high-charged nuclei called HZE ions. Radioactivity is a measure of how many atoms are disintegrating over time. The unit for "absorbed radiation" is the Sievert, and is more typically measured in microSieverts. A chest x-ray is 20 microSieverts, an airplane flight from New York to Los Angeles is 40 microSieverts. A useful chart is shown below. 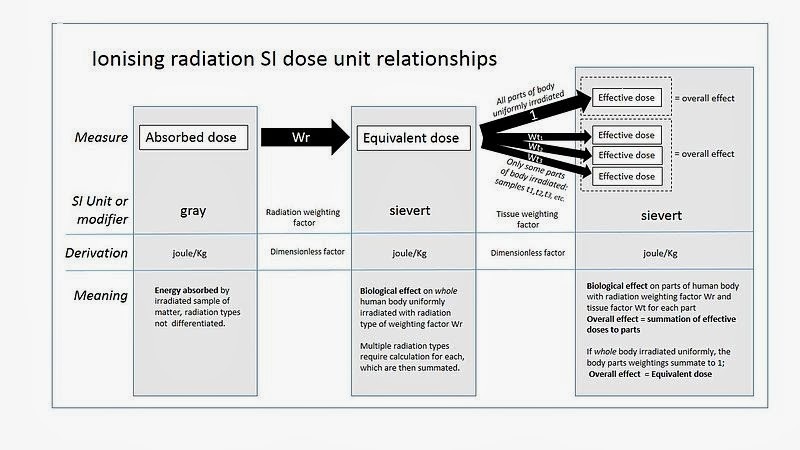 The sievert represents a measure of the biological effect, and should not be used to express the unmodified absorbed dose of radiation energy, which is a physical quantity measured in grays. The sievert is of fundamental importance in radiation dosimetry. One sievert carries with it a 5.5% chance of eventually developing cancer. Doses greater than 1 sievert received over a short time period are likely to cause radiation poisoning, possibly leading to death within weeks. The gray is used to express the physical quantity of absorbed dose, that is, the quantity of energy absorbed per unit mass, in any material, while the sievert is used to express the biological equivalent dose to human tissue. One becquerel (symbol Bq) is defined as the activity of a quantity of radioactive material in which one nucleus decays per second. The Bq unit is therefore equivalent to an inverse second, s−1. 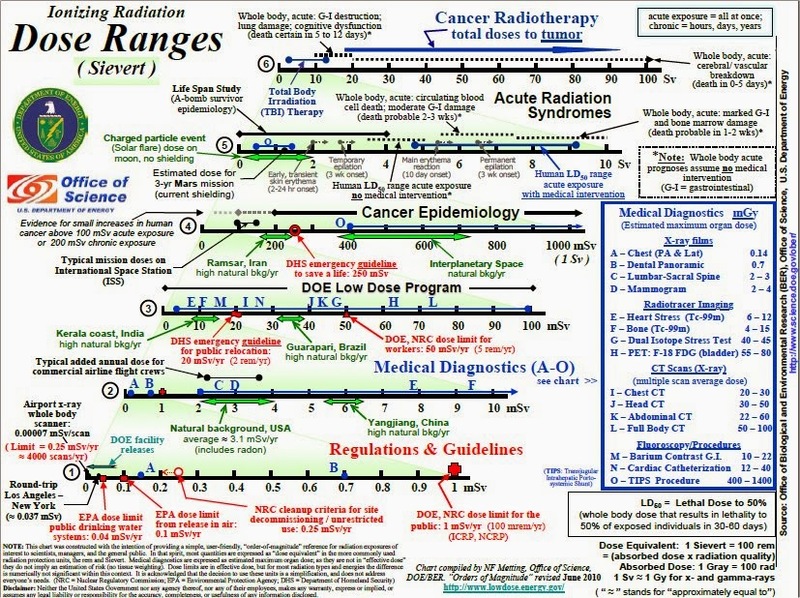 Acute radiation syndrome (ARS), also known as radiation poisoning, radiation sickness or radiation toxicity, is a constellation of health effects which present within 24 hours of exposure to high amounts of ionizing radiation. Radiation sickness is caused by exposure to a large dose of ionizing radiation (> ~0.1 Gy) over a short period of time. Alpha and beta radiation have low penetrating power and are unlikely to affect vital internal organs from outside the body. Any type of ionizing radiation can cause burns, but alpha and beta radiation can only do so if radioactive contamination or nuclear fallout is deposited on the individual's skin or clothing. Gamma and neutron radiation can travel much further distances and penetrate the body easily, so whole-body irradiation generally causes ARS before skin effects are evident. Local gamma irradiation can cause skin effects without any sickness. In other words, typical radiation (alpha/beta) only causes burns. It's not until you ingest some radioactive material that it causes internal damage. The sort of internal damage depends on which part of the body it binds to. For example - radioactive iodine binds to the thyroid, and causes thyroid cancer. 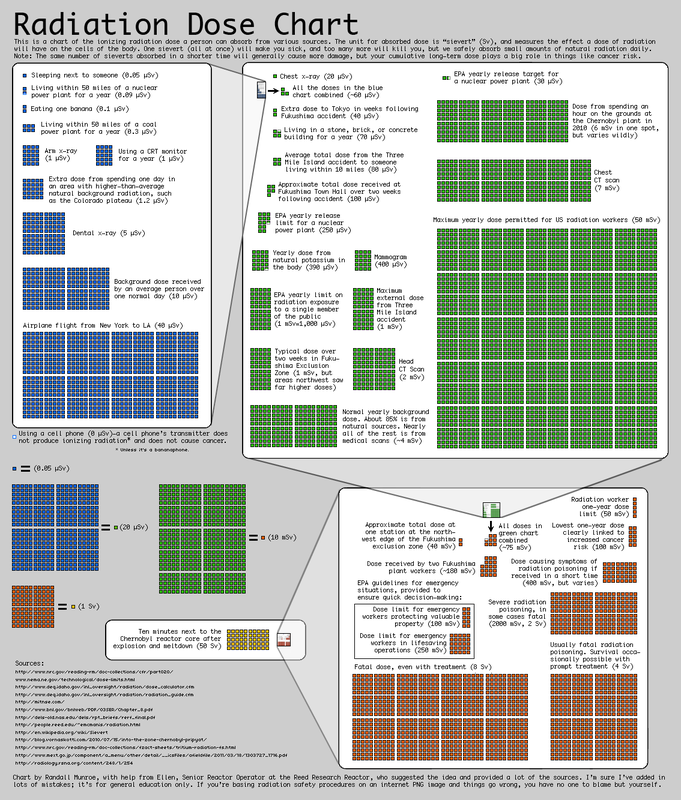 How does cesium-137 get into the body? People may ingest cesium-137 with food and water, or may inhale it as dust. If cesium-137 enters the body, it is distributed fairly uniformly throughout the body's soft tissues, resulting in exposure of those tissues. Slightly higher concentrations of the metal are found in muscle, while slightly lower concentrations are found in bone and fat. Compared to some other radionuclides, cesium-137 remains in the body for a relatively short time. It is eliminated through the urine. Exposure to cesium-137 may also be external (that is, exposure to its gamma radiation from outside the body). How can cesium-137 affect people's health? Like all radionuclides, exposure to radiation from cesium-137 results in increased risk of cancer. Everyone is exposed to very small amounts of cesium-137 in soil and water as a result of atmospheric fallout. Exposure to waste materials, from contaminated sites, or from nuclear accidents can result in cancer risks much higher than typical environmental exposures. If exposures are very high, serious burns, and even death, can result. Instances of such exposure are very rare. One example of a high-exposure situation would be the mishandling a strong industrial cesium-137 source. The magnitude of the health risk depends on exposure conditions. These include such factors as strength of the source, length of exposure, distance from the source, and whether there was shielding between you and the source (such as metal plating).